Cecilia Sanchez has two children and is pregnant with her third. When asked how far along she is, she simply tilts her head and shrugs. She doesn’t know because she hasn’t been able to see a doctor yet. She lacks the money for the bus to get to the clinic. 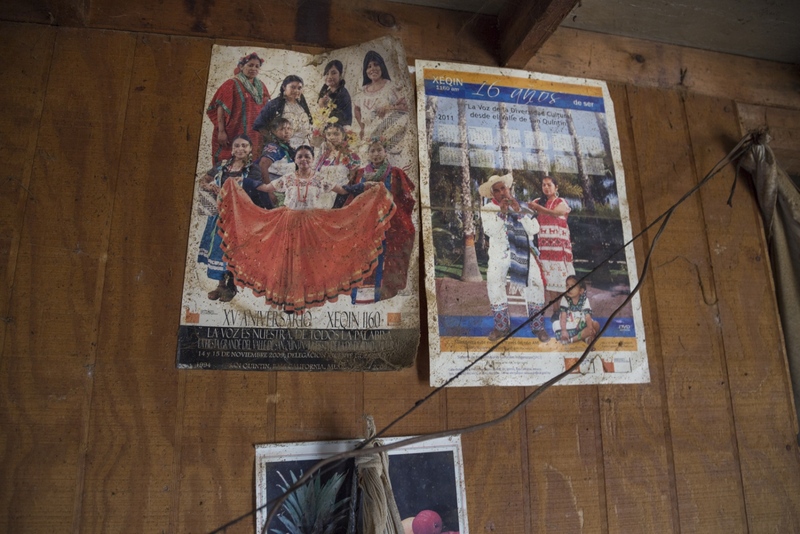 Sanchez’s husband works as a farmworker each day, sometimes spending more than 12 hours in the field. This month the crop is strawberry. He earns 700 pesos – about $35 – each week. In this day and age, many of us expect easy access to fresh fruits and vegetables at reasonable prices all year round but what we don’t think too much about is the human cost of what it takes to meet our demands. 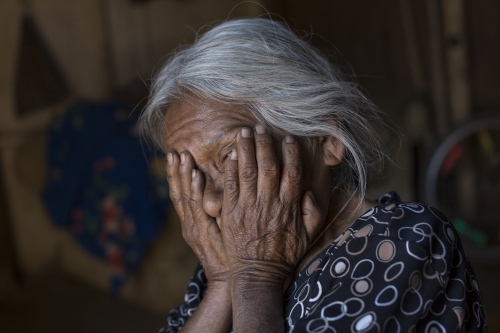 Multinational corporations affirm that their suppliers in developing countries have committed to providing decent wages to their workers but the reality is that the working and living conditions are generally appalling and their human rights are constantly violated. In Mexico’s San Quintin valley, thousands of indigenous farmworkers are hired on a daily basis as a source of cheap and flexible labor. They endure long hours hand-picking produce in extremely hot temperatures for as little as 9 dollars a day and live in areas of difficult access where large families are crammed into small rooms in makeshift houses made of little more than cardboard and plastic, without electricity or running water. The little money the make is not enough to satisfy their children’s basic needs of decent housing, healthcare and education, one of the most crucial things a child can use to overcome poverty and build a better future. Many kids are unable to attend school because their families cannot afford the nominal fees or pay for uniforms and shoes. They are instead left unattended as the parents head out to the farms or are soon taken to the fields where they are put to work helping to harvest the crops. 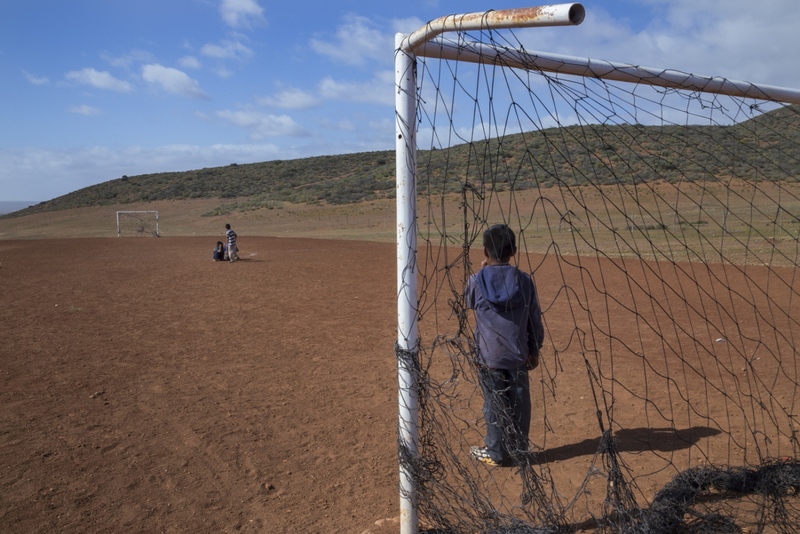 With little or no resources and limited access to an education, their childhood is lost and the cycle of poverty is perpetuated with little hope of a better future. San Quintin is a photography project that documents the situation of migrant farmworkers in Mexico and addresses pressing social issues such as poverty, health and human rights violations. My intention is to denounce the inhumane living conditions that the farmworkers endure as a result of the miserable pay that they receive meanwhile the corporations they work for make millions by the sweat of these laborers’ brow. 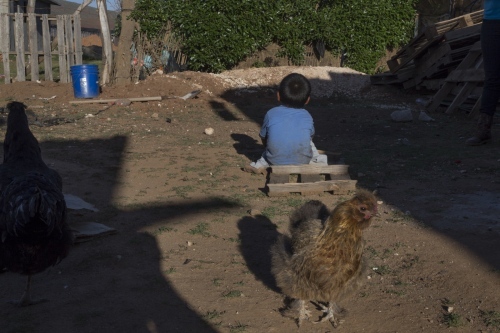 Alejandra peers out from her yard in the Emiliano Zapata village in Mexico's San Quintin valley. Located just about 200 miles south of San Diego, San Quintin is a rich agricultural region which ships most of its produce across the border to the United States. 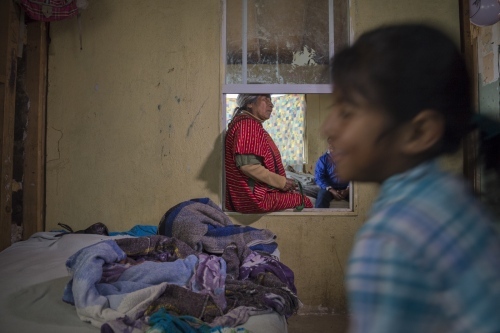 Francisca Ramirez at her daughter’s house in San Quintin. 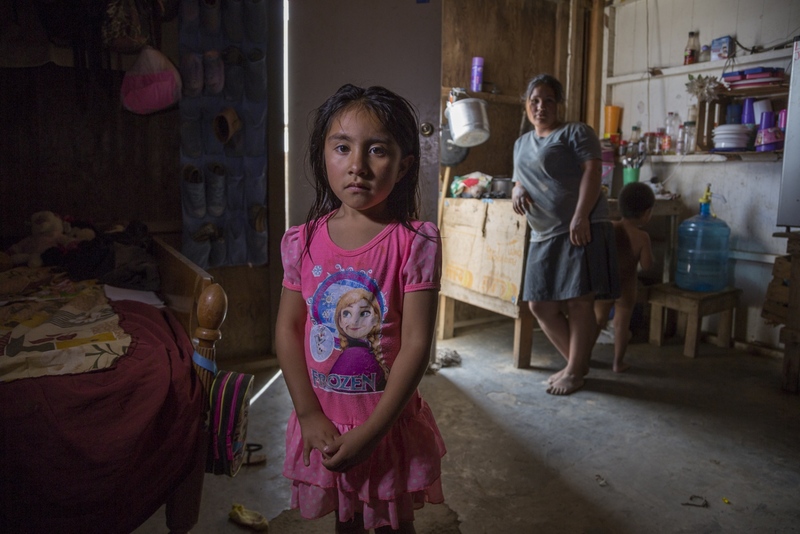 Ramirez is originally from Oaxaca but moved with her family to Baja California in northern Mexico in hopes to escape a life of starvation. 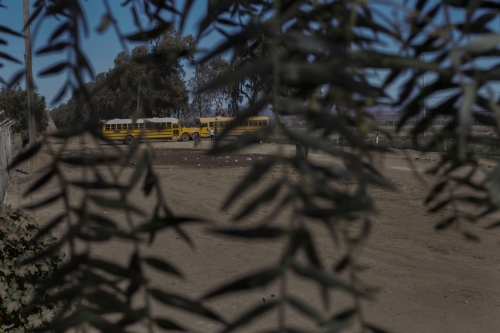 School buses used for transportation of farmworkers to the fields. 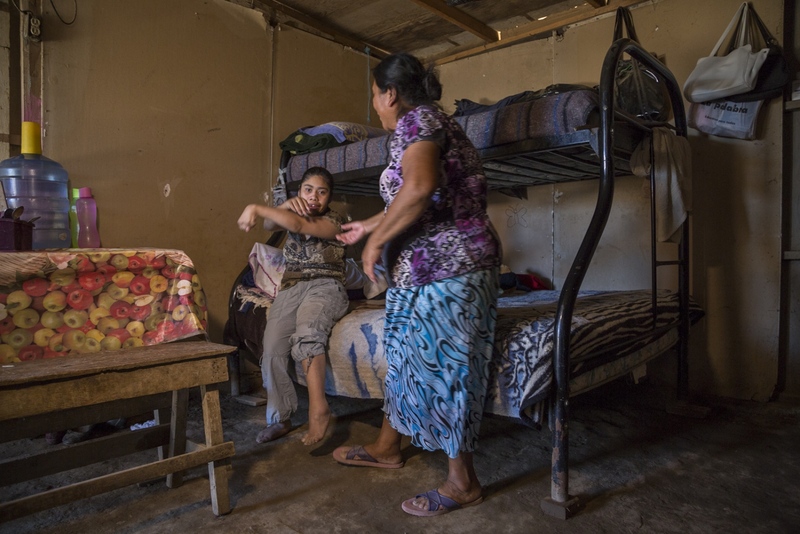 In San Quintin, thousands of indigenous farmworkers are hired on a daily basis as a source of cheap and flexible labor. They endure long hours hand-picking produce in extremely hot temperatures for as little as 9 dollars a day. Children play at a dilapidated soccer field in Mexico’s San Quintin valley. Many kids are unable to attend school because their families cannot afford the nominal fees or pay for uniforms and shoes. They are instead left unattended as the parents head out to the farms. Aurora Ramirez, 20, and her son Mario Alberto, 18 months, stand in the yard next to their house made of plastic and cardboard. Farmworkers live in areas of difficult access where large families are crammed into small rooms in makeshift houses. 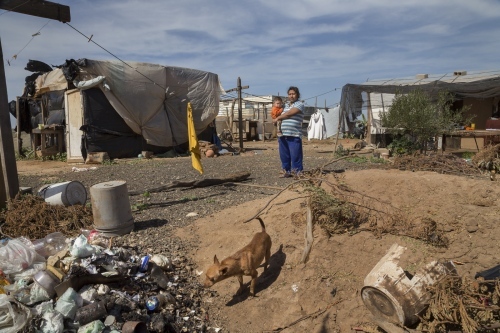 They live without electricity or running water and their front yards are often full of dirt, trash and burnt garbage. 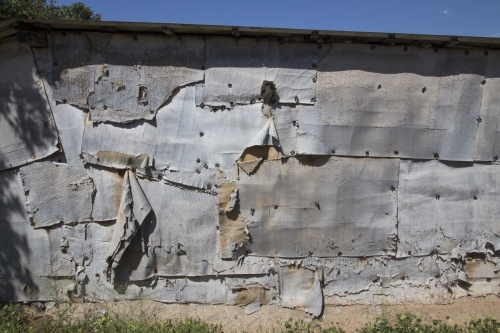 Dilapidated cardboard wall. Many laborers in the San Quintin valley use cardboard as a primary material for building their houses. 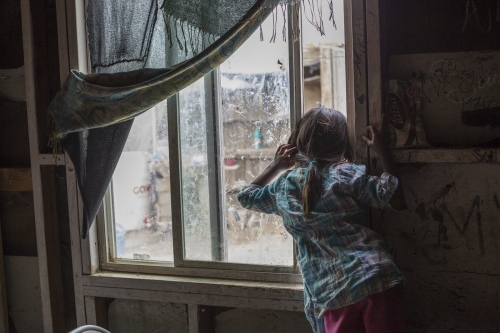 Azucena Bautista, 5, looks through the kitchen’s window of her house in Mexico’s San Quintin valley. Her parents work in the fields handpicking berries sometimes shifts of up to 12 and 14 hours. 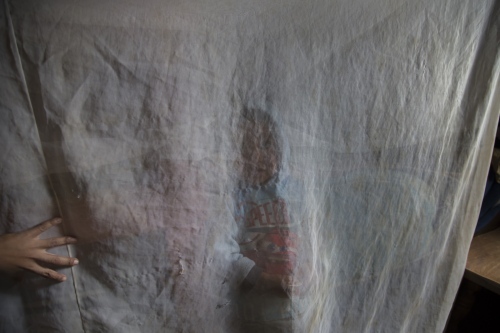 Edgar Ramirez, 2, hides behind a piece of cloth that separates his bed from the rest of the room that he shares with his mom Francisca and older brother Alexander, who is 11. Rosalinda Ramirez and her family at lunch time. Farmworkers in this region make very little money and cannot afford to buy meat or other protein. Their diet consists of mainly tortillas, beans and rice. 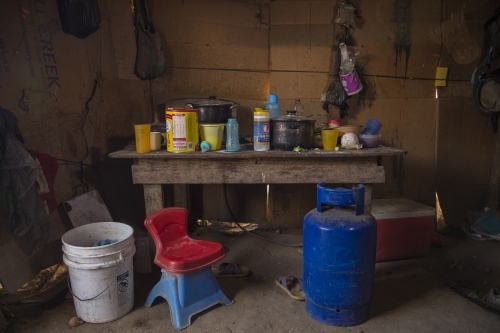 Kitchen area at the Moreno family residence in the rural town of Santa Maria de los Pinos. 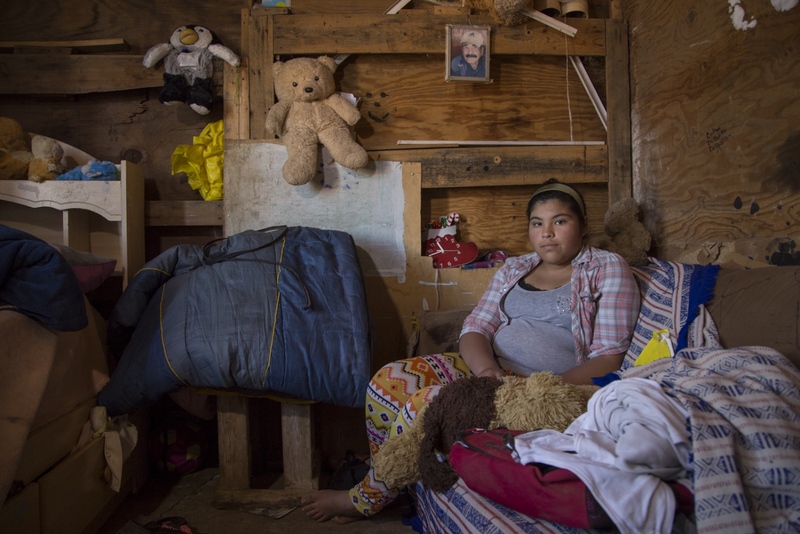 Cynthia Delgadillo, 14, sits in her room which is an add on to her mother’s house, made mostly of scrap wood and covered in plastic. She shares it with her live in boyfriend who is 17 and works in the field. Little Felis plays outside his humble house in Mexico’s San Quintin valley. 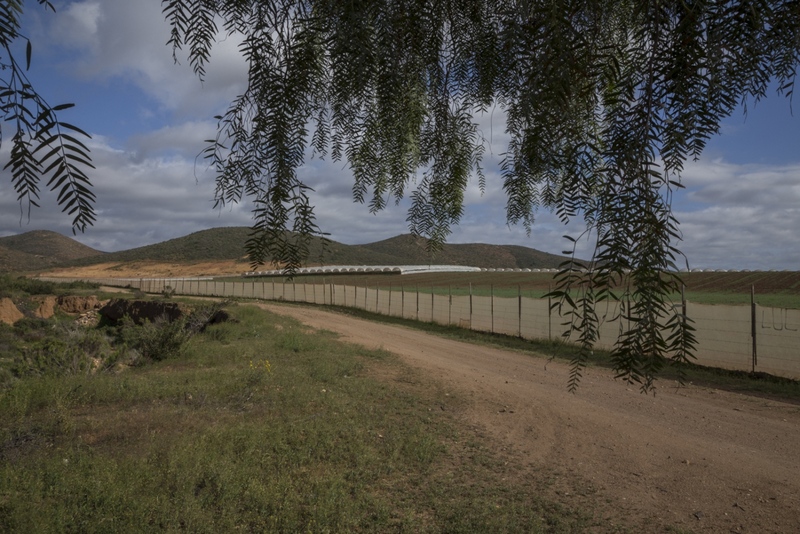 Mexico’s San Quintin Valley landscape with greenhouses in the background. In the past, farmworkers would return to their hometowns after the harvest season but in recent years many have settled in these regions due mainly to changing agricultural production methods that permit year-round employment. 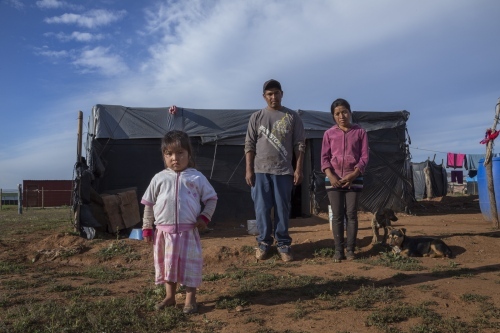 Twin siblings Marco Antonio and Mariana, 14 years old, with little brother Juan, 7 years old, and nephew Juanito inside their house made of plastic and cardboard. None of the kids attend classes or are enrolled in school. The twins sometimes go work in the field. On this day all they had eaten was an egg for breakfast and were unsure if their mom would bring food for their dinner. 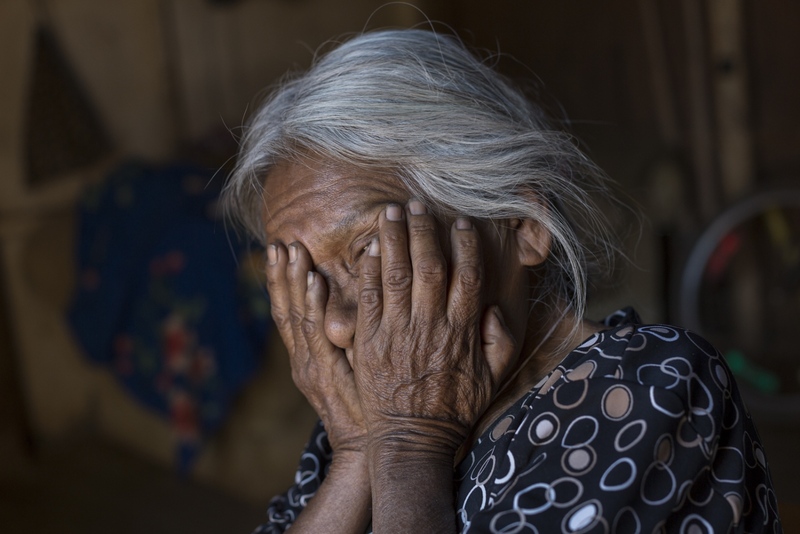 Maria Sabina, in her nineties, sits in her room where she spends most of the day staring outside. She shares the house with her daughter, son in law, granddaughter, grandson and their respective spouses. Wall decoration posters at Francisca Ramirez’s home in San Quintin. 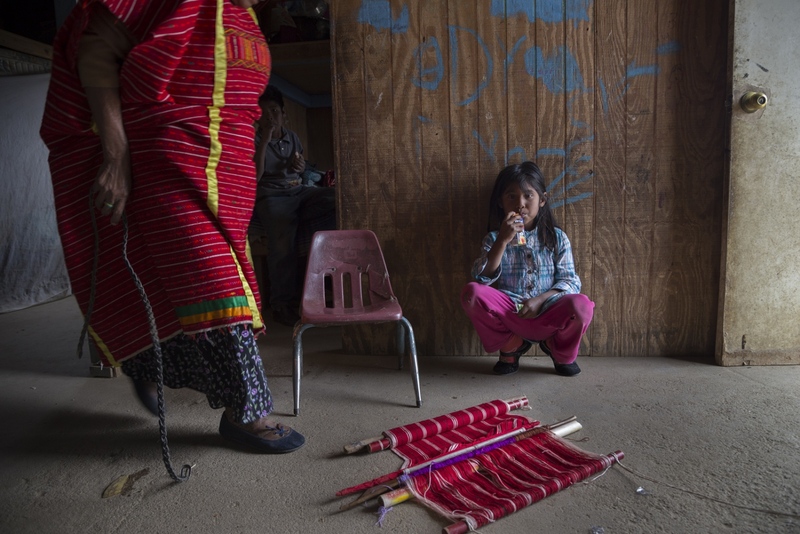 Many indigenous farmworkers in San Quintin are originally from southern poor states such as Oaxaca and Guerrero. 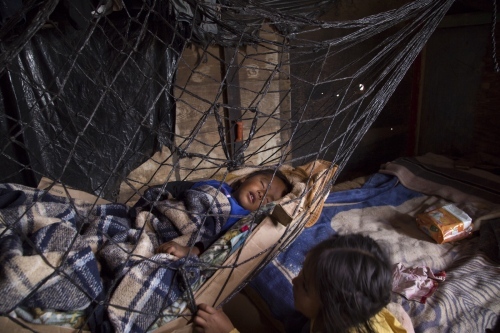 Baby Moises Macario is being watched by his older sister Abigail, 3, while he is taking a nap. 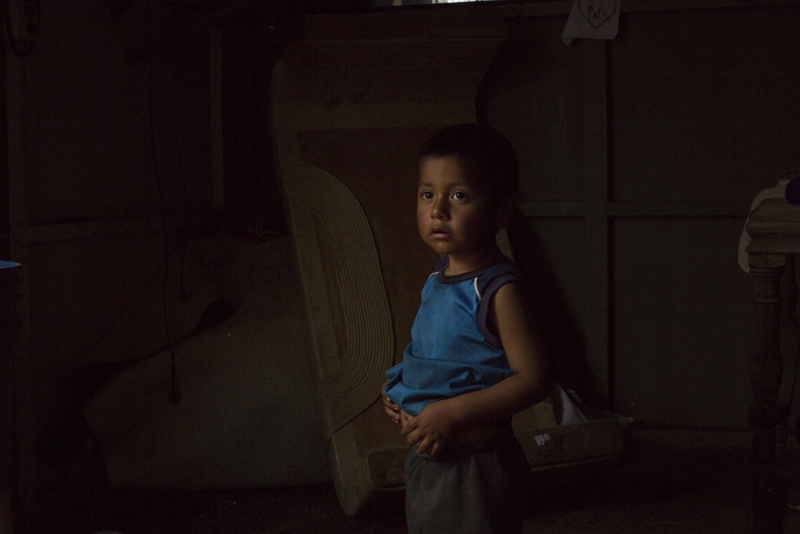 Brayan, 3, in his house constructed of particle board and plastic. His father makes 7 dollars a day picking strawberries sometimes working more than 12 hours. This is the only income for a family of 4. Azucena Bautista, 5, sits and waits for her grandmother Francisca who is getting ready to start looming in a traditional Oaxacan stile in their house in Mexico’s San Quintin valley. 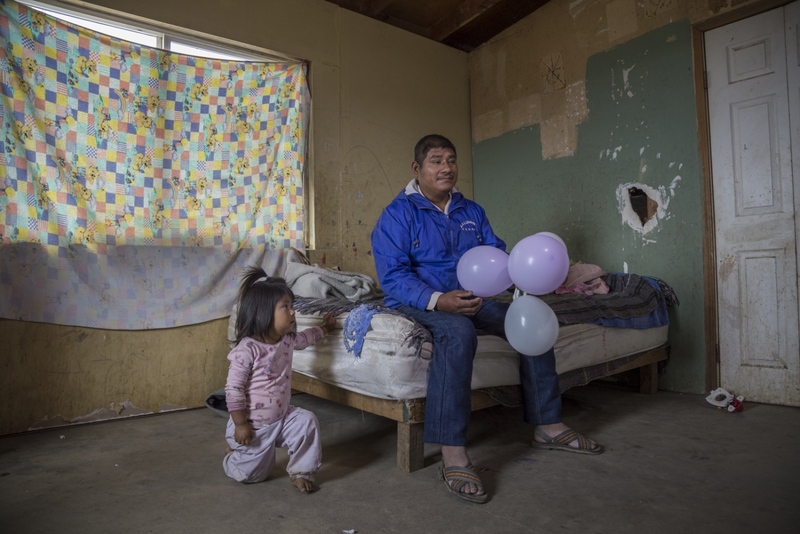 Felipe Ramirez sits in his bedroom with one of his granddaughters. Felipe works in the fields hadpicking strawberrys. He makes 10 dollars a day. 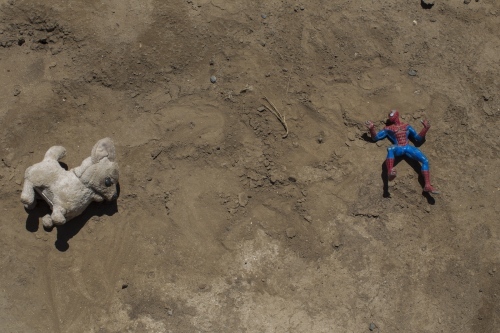 Toys left on the street in Mexico’s San Quintin valley. 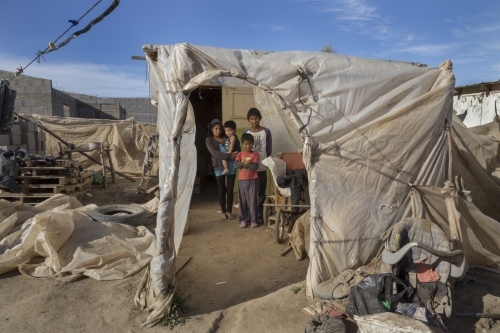 Two year-old Genesis with her parents Mauricio and Maribel Reyes outside their house made of cardboard and plastic in Mexico’s San Quintin valley. Genesis’ parents both work in the field and make 7 dollars a day each. They live in extreme poverty without electricity or running water. Eduarda Lezma with her 24 year old daughter Adali. Adali is mentally disabled and needs constant supervision. Six year-old Litzy stands with her mom Esmeralda and younger brother Jafet, 2 years old, inside their humble one-room house in Mexico’s San Quintin valley. 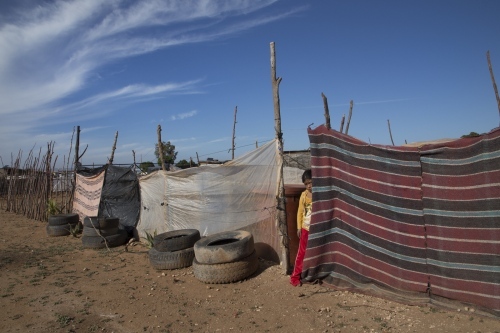 They live without running water and get electricity shared to them through a neighbor. 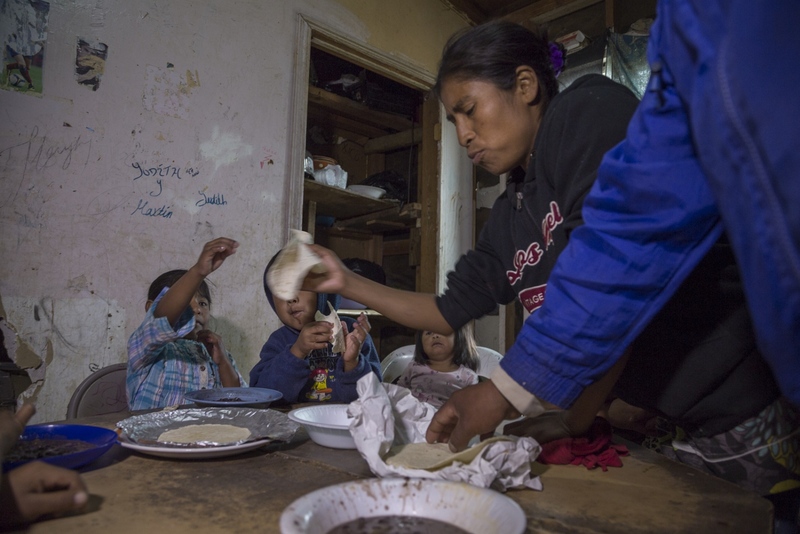 Esmeralda’s husband works in the field picking tomatoes and makes 150 pesos a day, approximately 8 US dollars. Siblings Juan Carlos, 6, Lizbeidy, 3, Luis Angel, 7, and Yolet, 9, play in their room of their house made of cardboard and plastic in the San Quintin valley in Mexico. Their parents work in the fields handpicking strawberries for 9 U.S dollars a day sometimes working more than 12 hours. Isabel Policao inside of her humble house made of cardboard and plastic in Mexico’s San Quintin valley. Griselda San Martin is a documentary photographer and visual journalist based in New York City, Tijuana, and Barcelona.